Facebook or Instagram: Which Platform is Best For Marketing? Social media has become the hub of attention. Every day, people spend countless of hours on social media, and that makes it a great place to gain attention and impact your audience on. However, a common question is what kind of social media platforms you should choose. And because Facebook and Instagram are two of the top social media platforms, it’s obvious that people will wonder which of them is the best, so they can choose one of them.And although Facebook now owns Instagram, they are still quite different and should not be treated equally. And they should definitely not be approached with the same marketing strategy. And although Facebook now owns Instagram, they are still quite different and should not be treated equally. And they should definitely not be approached with the same marketing strategy. So how do you actually choose, and what kind of pinpoints should you look at when comparing the two? In this article, we’ll compare the two giant platforms and help you make up your mind on Facebook or Instagram: Which Platform is Best For Marketing? I could have started this article with the answer “it depends”, because it does. But since an answer like that doesn’t help us too much, I didn’t. First and foremost, it depends on the user demography and your target audience. You, of course, want to use the platform which most of your target audience is using, but if there’s no major difference, it might not be as important, because you won’t be able to reach all X million people who are using Facebook/Instagram and are your target audience. Has existent since 2004, therefore, there’s no question why it is more popular among the earlier generation. 21% of its users are teens. Started in 2010 which means it serves a young audience. 38% of its users are teens. As the demographics and statistics very clearly show, there’s a difference in the age bracket of the two platform’s user bases, and this is one of the key things you should take into consideration when choosing the platform and creating your marketing strategy. The conclusion you can draw from the statistics above is that Instagram is perfect for your brand if you’re target audience is a younger audience. However, it might be good to think about the fact that the older generation has a higher income, generally speaking. But then again, it depends on your business. If you’re selling expensive $100K+ products, you may be out of luck targeting an audience with less money, generally speaking, of course. This means that Facebook might be more suitable for you. But on the other hand, if you’re selling products that are somewhat affordable, Instagram might be the perfect platform for you because you can share appealing visual content of your products, displaying them just how you want them to be seen. 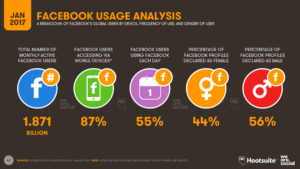 Several studies have been made, measuring the engagement rate on several different social platforms. But now, we’ll focus on a particular study which measured the social media engagement of 3 million users on seven social networking sites. As you can see, the numbers speak quite clearly. Because Instagram has a much higher engagement rate, Instagram is, of course, considered to be more engaging than Facebook. 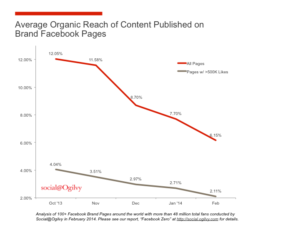 As the number of users on Facebook increased, so did the amount of content being posted. This means that people’s feeds quickly got flooded with content, leading to Facebook introducing a new way of displaying content with the help of an algorithm which decides what you think is interesting, and not a chronological feed as it used to be. Apart from that, Facebook is also limiting your reach consciously. And here’s where it gets controversial. Many brands believe that Facebook is limiting the reach because they want brands to realize they need to buy Facebook ads in order to reach their audience. Because of all the complaints and allegations Facebook received, they published an article, written by Brian Boland on their Facebook business section, explaining the deal with the organic reach. However, because of the limited reach on Facebook, Instagram has become a platform that is a lot more attractive and where brands can keep their customers engaged. Instagram has therefore been able to show better marketing results than Facebook (Only using organic reach and not paid advertising). As Facebook has obtained Instagram, they are expected to run the same race with Instagram. They have for example changed from the chronological feed that once was to the algorithm based feed, just like they did on Facebook. So probably, and unfortunately, there’s a big chance that they will start limiting people’s reach on Instagram as well. What’s the nature of the platforms like? As we talked briefly about earlier, Instagram is a great platform if you want to share mostly visual content, for example, product images etc. but if you want to focus more on text and have links in your text, Facebook is the obvious choice, as Instagram doesn’t allow clickable links in your post captions, only in your profile bio. How many marketers are using the two platforms? 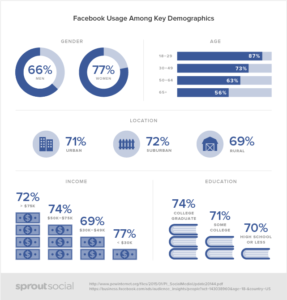 Facebook: Roughly 93% of the total marketers are using Facebook for marketing. 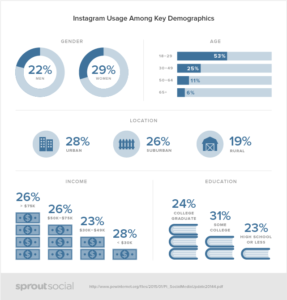 Instagram: Roughly 36% of the total marketers are using Instagram for marketing. First off, this means that there is more marketing space and a potential for you on Instagram, because the platform hasn’t become saturated with marketing yet. While the difference in marketers seems to be huge, looking at the numbers above, it’s important not to forget that Instagram is a younger platform, and many marketers need time adjusting to new marketing sources. Facebook has shown to be a better platform for paid advertising, but a worse platform for organic reach. Facebook also offers amazing tools for tracking the results and ROI of your marketing campaigns. Because Instagram is newer than Facebook and just recently introduced ads on its platform, it will of course not be as developed as Facebook, however, when setting up your Instagram ad campaign, you are taken to the same campaign setup as Facebook, which means Facebook has taken their knowledge about ads and implemented into Instagram, which is a really smart move. Because after all, Facebook as spent years and years refining and tuning their ad setup so brands can get the most out of it, and it would be foolish to start from scratch with Instagram. Instagram and Facebook are two very different platforms that need different approaches, content, and strategies. Instagram offers a better organic reach without the need for paid advertising and Facebook has, in some cases an almost non-existent organic reach, which means brands have to pay for ads if they want to generate any type of results from the platform. Facebook is a platform more focused on the written word while Instagram is almost solely dependent on visuals. Despite Facebook having a larger user base, Instagram has a lot of untapped potential for marketers and is a better platform for engagement. So based on all the information you’ve gotten, you need to make a choice if you’re going to use Facebook, Instagram or both of them. The choice is completely dependent on your marketing strategy and who your target audience is.